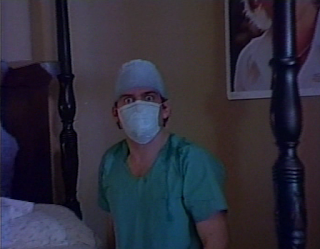 Yet that excess, both in quantity and in style, is one of the things I like about slasher films. Just like the spaghetti western, there is a very clear golden age for these movies and core set of films that seem to define it. Trying to track down and watch all of these no-budget schlock films could become a full time job. There are always new entries being discovered, seemingly lost when video stores closed their doors and the VHS era ended. The Scream Theater line of horror film double features from VCI Entertainment is definitely an homage to the forgotten scares from the drive-in and video era. Each installment (I believe there are eight) present two retro, drive-in style movies on one DVD, usually with very low techincal specs. I can't say for certain, but I believe these are VHS rips. They're no-frills editions, and the price (currently $6.99 each on VCIEntertainment.com) reflects this. I picked up Volume 1 and 2 during a sale (yes, even cheaper than $6.99) a few months ago and opted to watch Volume 2 first because both films are from the '80s and firmly sit within my video era comfort zone. First is Terror At Tenkiller (1986), which is very much drawing from all the formulas and cliches of the slasher movement. Two young ladies retreat to Lake Tenkiller, a vast body of water in Oklahoma (actually the film shot on nearby Lake Fort Gibson), in an attempt to escape a clingy d-bag of a boyfriend. 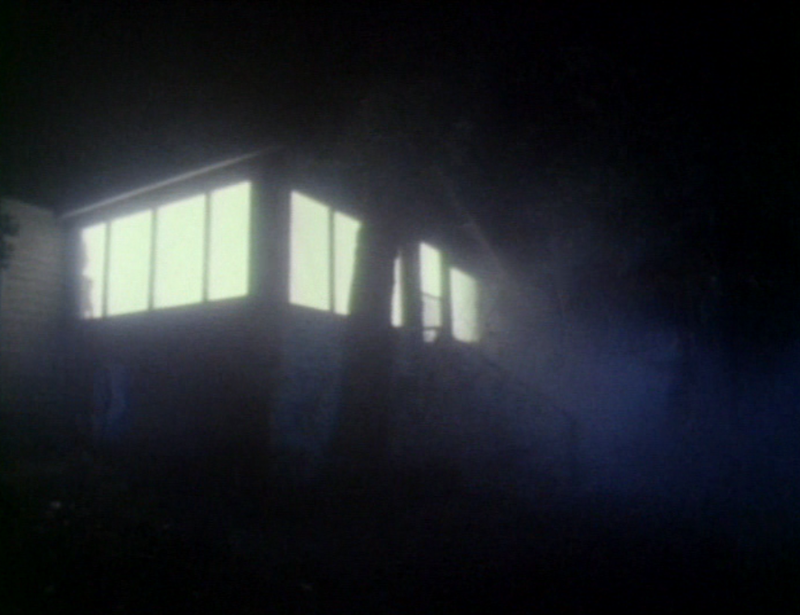 We've got young women alone at a cabin in the woods, suspicious and anti-social locals, and creepy old guys who like to hang out in the dark and leer into windows. The biggest drawback of Terror At Tenkiller is that it's overlong and a little boring. Most slasher films try to pass the time by giving us a large group of irritating kids that we can watch, get to know, and then see slaughtered in creative ways, but this movie really only focuses on our two female leads and the occasional side character. There are no parties, no pizzas on turntables, no forbidden love in barns. Instead, we spend a lot (too much) of our time on a character who isn't sure if she loves her jerk boyfriend or not. Still, for cult film aficionados, there are some bright spots. The biggest appeal of these ultra-low-budget horror films is the DIY spirit on display. There's a very stripped down synthesizer score that sounds like it was done on an entry-level keyboard, but I love stuff like that. The two lead women, despite having never worked in a film before or after this, often seem very comfortable and natural. Little things that you don't expect in films like this, such as cool lighting effects and some really imaginative shot compositions, reveal an ambitious director with aspirations at something better. There are also some decent gore effects, and even a cool closing credits song that has a mid-80s radio rock thing going for it. The thing that I love (yes, love) about tiny little genre movies like this one is that they often represent someone's only large-scale creative output. Many times, these films are the only movies their directors ever made. They took all their ideas, saved their money, called in all their favors, and gave everything they had to this one shot. That's the case here, with this being the only writing credit for the screenwriter Claudia Meyer and the only directing credit for Ken Meyer. While the movie is obviously riddled with cliches and seems to be under the influence of Friday the 13th, there's still something likable about Terror At Tenkiller. It's not good, but it's got human fingerprints all over it. I respect it. I can't say the same for The Last Slumber Party (1988), the other film on the disc. With neither the sense of earnestness or any sense of atmosphere, it's hard to take The Last Slumber Party seriously, but I'm not sure that it was ever intended to be anything more than ridiculous fun. Seriously, you don't make a movie this hilariously bad by accident. Seemingly trying to add a new entry in the Slumber Party Massacre tradition, this movie feels rushed and unprofessional in every way. The "actors" fumble their lines and stumble throughout the entire story. If my research is correct, this movie was shot entirely on video tape, which has none of the expensive limitations of film. Assuming that's correct, I don't know why the director (Stephen Tyler, not to be confused with the frontman of Aerosmith) didn't just reshoot the scenes. Still, I've learned to give the benefit of the doubt to filmmakers, because one never knows what sort of limitations they were facing. Maybe their time on the location was limited and they had to shoot as much as they could and get out quickly. Maybe the actors had fumbled the same lines over and over and the director decided he could live with what he had. Besides, I'd be lying if I said that this movie wasn't fun because of all the loose elements. Even the editing suffers, with some scenes lingering way too many beats longer than they should. If you've ever watched WWE wrestling and seen the backstage promos, you know how a wrestler will say what they have to say and then stomp out of frame while the interviewer stands there awkwardly, looking into the distance as we all wait uncomfortably for someone to say "cut." That sort of moment is repeated over and over in The Last Slumber Party. It's particularly evident in a phone call scene where we cut back and forth between two halves of a conversation that leaves literally seconds in between lines of dialogue. Tighter editing would have fixed this. But again, it all adds to the fun. I mentioned in a YouTube video that I'd be watching these movies during the Halloween season and literally every scrap of feedback I got about The Last Slumber Party was that it's awful. This is true: the movie is aggressively bad. But it's bad in a way that makes it very fun to watch. Unlike Terror At Tenkiller and that film's lean cast, we have a robust group of teens here just waiting to be bumped off, and we have a killer (played by the director) who is absolutely a cartoon character. He has no lines, but he couldn't be louder. Coming after the relative seriousness of the first movie on the DVD, the over-the-top killer is a welcome change. The Last Slumber Party is a seriously goofy movie, but I really think it knows it. There is definitely a party atmosphere to this flick, as evidenced by a collection of hair metal songs from a band called "Firstryke" that plays pretty much throughout the entire movie. Crap? undoubtedly. But it's fun crap. Just as with Terror At Tenkiller, this film is pretty much the only movie that the people who made it ever created. The director did participate in documentary film a full twenty years later, but it's not a personal project. The Last Slumber Party is his only cinematic baby. It's also worth noting that this was primarily shot at a suburban house in Metarie, Louisiana, just outside of New Orleans. That regional feel is another huge appeal of these tiny horror films from the VHS era. They don't look like they were shot in Hollywood because they weren't, and that visual break in style can be really refreshing. While this movie is ridiculous, poorly edited, and sloppily crafted, the appeal of seeing what people can accomplish completely outside of a movie-making system is high for a certain type of film fan. Neither of these movies are "good," but they are small, completely independent, regional examples of the kinds of movies that got made in the 1980s. As with most exploitation movies, the incredible poster/video box art is way better than the movies themselves. I have no idea when I'll revisit them, but it's somehow comforting to have them on my shelf and to know that all the work these people put into creating and crafting their independent films three decades ago has not been entirely forgotten. These super-low-budget horror films aren't for everyone, but for those who like seeking out the ugly corners of forgotten cinema (we know who we are), there's stuff to enjoy here.